Sorry about the cat. And about the date she got run over. Guess it didn't matter to the cat, but you probably had a bad day anyway. I met the cutest little doggie this weekend. She's so teeny-tiny, you wouldn't belive it. She's a mix between a Yorkshire-Terrier and a Pug and 5 months old. Mellie is even smaller than my cat (!) and I guess she won't grow that much anymore. So small, but such charm! I fell completely for this lil fella. So, two new things happend to me within five minutes of meeting Mellie: first, I never could have imagined to have a small dog. I like small dogs just fine, but always wanted to have big ones. 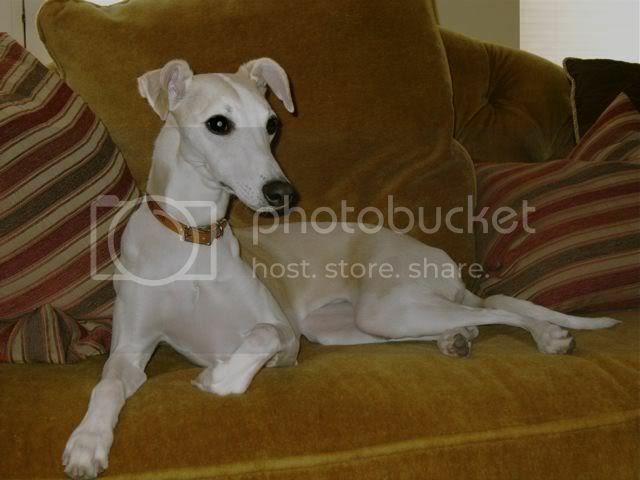 Second: until this weekend I felt I wasn't yet in a position to even think about another dog. But of course my aunt is totally into her little sweetie. The two are a wonderful team. I'm freshly in love, kind of! Small dogs do have plenty advantages: the girls could help with walking the dog; it's much easier to find a dog-sitter for a small dog when you're on vacation; the kids always wanted to have a small dog (additionally to Max of course, they loved him dearly); small dogs don't need that much excercise; it's easier to take them with you for vacations; people are not afraid of them; and so on. Now I'm thinking seriously about having a dog again, and about possibly looking for a small dog, or at least being open to any size of dog. But I will be on vacation all of July, so nothing will happen until August an least. I won't start looking at those online pages for poor homeless dogs because when I do, I know it wouldn't take long and some creature would melt my heart. Awww... but as David says life goes on and I'm sure the kids would love a little furry friend! Yes, little Mellie is definitely a keeper. What a little cutie!!! Congratulations to your aunt. They eat less, so you end up spending less money on dog food. There is less poop to pick up. Accidents inside the house are easier to clean up. I'm sure you'll know when the time is right to add a new dog to your family and you'll choose the perfect one (whatever the size). My dogs range in size from 100 pounds to 5 pounds. I love them all. I'd say the biggest differences to me are...the big ones have been much easier to train to go outside for the bathroom, but when I want to run errands around town and take one with me...the little ones are easier to load up. 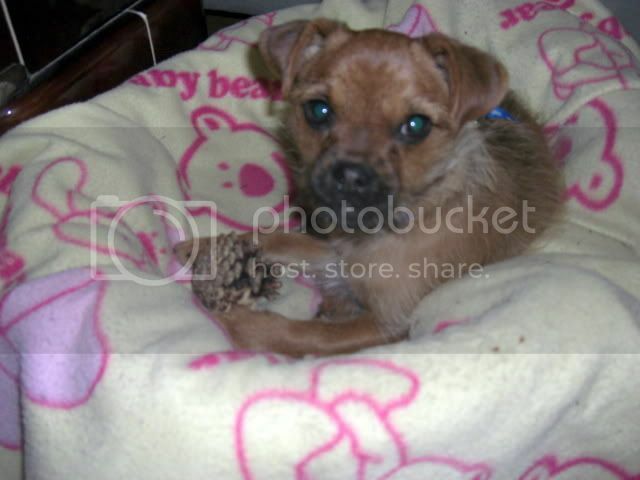 Mellie is a yorkie/pug? Very cute! My cousin has a yorkie/chihuahua that looks similar. 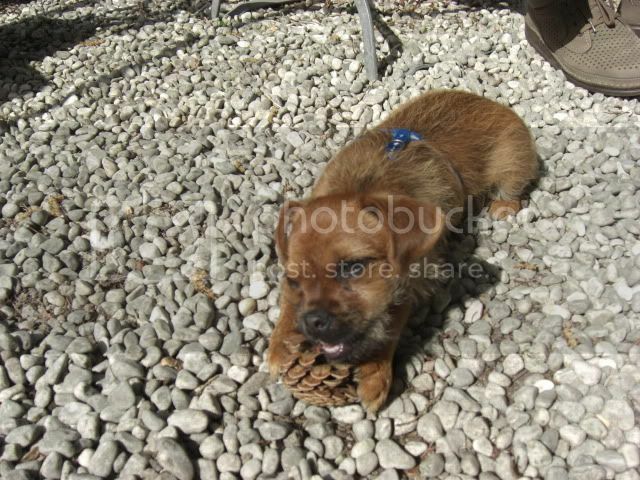 It looks like Melli has a thing for pine cones!! Another good point! She looks like the perfect accessory for your couch!